The JCCSF presents Rabbi Joseph Telushkin, author of Rebbe: The Life and Teachings of Menachem M. Schneerson, the Most Influential Rabbi in Modern History. Click here for more information. Rabbi Hershey Novack of Chabad at Wash U will lead a discussion group on Joseph Telushkin's new book Rebbe: The Life and Teachings of Menachem M. Schneerson, the Most Influential Rabbi in Modern History Thurs, July 17, 6pm at Subterranean Rabbi Novack considers himself a disciple of Rabbi Menachem M. Schneerson and met him a number of times. He will share insights and answer questions about this new book and about the Chabad Lubavitch movement. For more information please email rabbi@chabadoncampus.org Copies of REBBE will be available for purchase at the event. 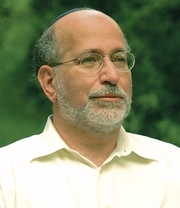 Rabbi Joseph Telushkin (born 1948) is an American Modern Orthodox rabbi, lecturer, and author. He was ordained at Yeshiva University, and studied Jewish history at Columbia University. Joseph Telushkin is currently considered a "single author." If one or more works are by a distinct, homonymous authors, go ahead and split the author. Joseph Telushkin is composed of 13 names. You can examine and separate out names.